Jamie Foxx is now known as a huge movie star, a respected actor and such. His roots began in stand up comedy, which led to him getting a spot on In Living Color, then gaining his own show. 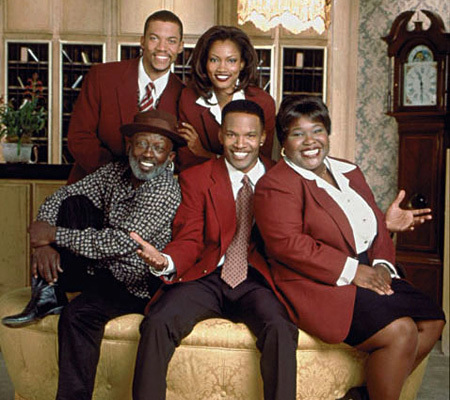 The Jamie Foxx Show ran on the WB Network from 1996-2001, reaching the 100 episode mark over 5 seasons. Executive produced by Bentley Kyle Evans, who worked on Martin(he also had a recurring role as "Titus" on the show, the dude who called Martin "Almond Joy") as well, the show featured a very open brand of comedy, allowing the actors themselves to nearly break character and laugh(which was kept in the finished product instead of taken out, giving the show a realer feel to it). The show wasn't necessarily a huge ratings success, given that it was on the WB Network anyway, but it managed good enough ratings to sustain for 5 hilarious seasons. The basis of the show was essentially Jamie(as Jamie King) moving from Texas to Los Angeles, to pursue his dream of making it in the entertainment business, he starts working at his aunt and uncle's hotel to make ends meet and survive, and from that first moment, hilarity ensues. From Jamie's back and forth with co-worker Braxton to his dream of dating his co-worker Fancy, those stories helped to carry the show. Braxton, Fancy, and Jamie have a comedic chemistry with each other and the jokes fly non-stop. Some of the hilarious moments took place during season 1 of the show was Jamie deciding to play mentor to a young child named Nelson to impress Fancy, but having it backfire when the kid ends up taking Jamie for a lot of money and stealing Uncle Junior's cigar collection. Another crazy moment from season 1 was where Jamie decides to take Braxton to a club owned by Gary Payton and the women there turn out to be all wrong, eventually leading Braxton, who gets called "B Smooth" to be robbed by two ladies. The first season of the show was vital because it set the tone for what was to come, plus brought forth the entire dynamic of the show. Jamie never deviated from his dream of making it, his pursuit of Fancy, or his love/hate friendship with Braxton. As the seasons progressed, we would see Jamie start to break through in regards to his dream, allowing us to be blessed with his single, the hilarious "Poppin Collars", which spawned an outrageous episode with Jamie going to drastic measures to shoot the video. We went to traffic school with Jamie and Braxton, watched Fancy give Jamie a chance, only for him to come up short the first time, and of course.... How could we forget... Jingles 2000. There were plenty of guest stars who provided an extra element to the show, K-Ci and JoJo being the most prominent, as Jamie ended up going on tour with them for the show, which led to big issues between him and Fancy, as far as their romantic future. Of course, the show ended on a great note, with Braxton finding love and Jamie marrying Fancy, but the road to get there was definitely something to witness. The Jamie Foxx Show is one of my personal favorite black sitcoms from the 90s and I truly think it deserves more credit, not only for the episodes themselves, but for launching a huge career, and also, the theme songs. That's right, the theme songs. I'll leave you today with the glory that is the Jamie Foxx Show theme songs.